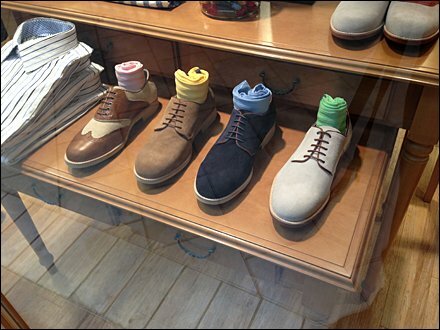 Only “Hand in Glove” go together better than “Shoe and Sock.” Here those two are merchandised together as a Shoe and Sock Color Cross Sell in a single compact offering. More important than the adjacency is the sophisticated fashion advice. I would easily have paired the blue socks with the blue shoes in a purchase. But seeing the yellow and pick pairings I would consider as something more sophisticated than my own tastes could conceptualize. 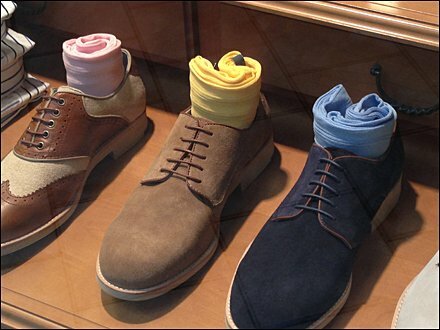 CLICK the thumbnail for a somewhat broader view of this Shoe and Sock Color Cross Sell.